So, a couple of you asked for tips to reduce dark spots so here’s a tip that not only reduces dark spots but it actually brightens your complexion! 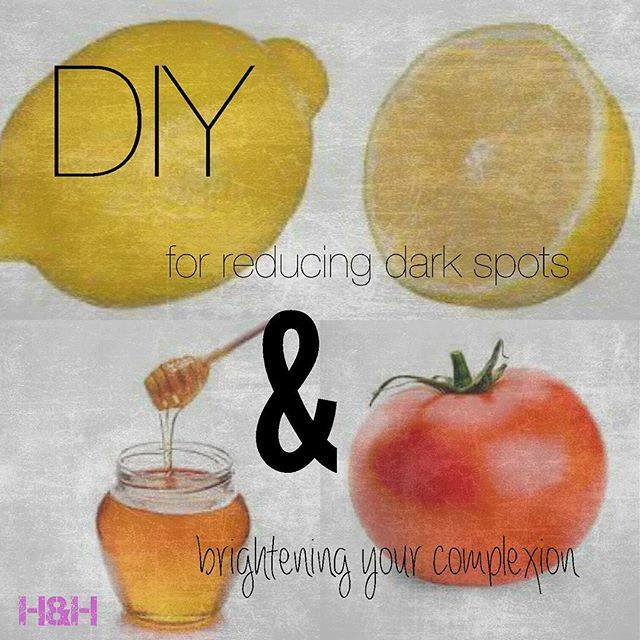 By brightening your complexion I mean it brings a natural glow on your face and gets rid of the tan that you’ve gotten! The best thing about this tip is that its all natural and pretty cheap! All you need is lemon, honey and tomatoes! Yup, that’s all! Now its pretty easy,1- make a paste by mixing lemon and honey by any proportion that suits your skin, (I’m mentioning this because people with sensitive skins tend to get irritated by the excessive use of lemon on their skin) and then apply it on your face for about 10-15 minutes and then wash it off with luke warm water. You’ll definitely feel a glow on your face after this one because firstly lemons have antioxidants that are very good for skin complexion and it also tends to act as a bleaching agent for your skin, Honey on the other hand helps in fading acne scars and ageing spots. 2- Crush a tomato or two and add half a lemon init to mix it together to form a paste, apply it on your face and let the tomato juice and lemon juice dry, wash it off with luke warm water again! Tomatoes have vitamin A, C and K which enhance your skin and leave it radiant! Apply these pastes at two different times and not one after another as the excessive use of lemon may harm your skin. I’ll recommend you to apply one in the morning and the other later in the evening. Apply these pastes once or twice a week and you’ll definitely see a difference!